Jacob Barrow died in London in 1798 aged 46. He was married in Bevis Marks in 1785 at which time he was probably a fairly new arrival from Barbados where his mother died in 1773 and his father was to die in 1801. He served on the Mahamad at Bevis Marks in the years 5555 and 5559 (corresponding to 1795 and 1799 - so his second term was virtually nullified by his death on 24 Sep 1798 barely into the new Jewish year). His father-in-law Semayeh Nunes served in 5531 and 5536. Many of us can find an ancestor on this page showing the 22 grandchildren of Jacob Barrow. Thus, the Yorkshire Lousadas descend from the 2nd Lousada marriage, the Australian Lousadas from the 3rd, John Bury and some of the Bacons from the 4th, H G Lousada's descendants from the 5th and the Bedfordshire Lousadas plus Anthony Gordon from the 6th. Edmund Barrow and David Linton descend from (respectively the first and second of) the 3rd Barrow marriage(s), the Australian Skippers from the 4th, Tony Harding from the 7th, and Carlottta/Peter Barrow plus Rupert Musgrove and Tacy Rickard from the 11th. This intermarriage echoed the Barrow, Lousada, Son & Co business relationship described here. We wondered whether - after Bella (in 1826) and Simon (in 1828) lost their spouses - the 13 Barrow children and the 9 Lousada children were brought up together in the house of Simon Barrow in Bath. He converted to Christianity, so unsurprisingly the ancestor of the Australian Lousadas - John Baruh Lousada who married Simon Barrow's eldest daughter Tryphena - converted also. The following notes from ref 85 show baptisms of their first three children, and for the first 2 in 1833 and 1835 they are indeed resident as a married couple in Lansdown Grove, Simon Barrow's House and still in Bath for the third. 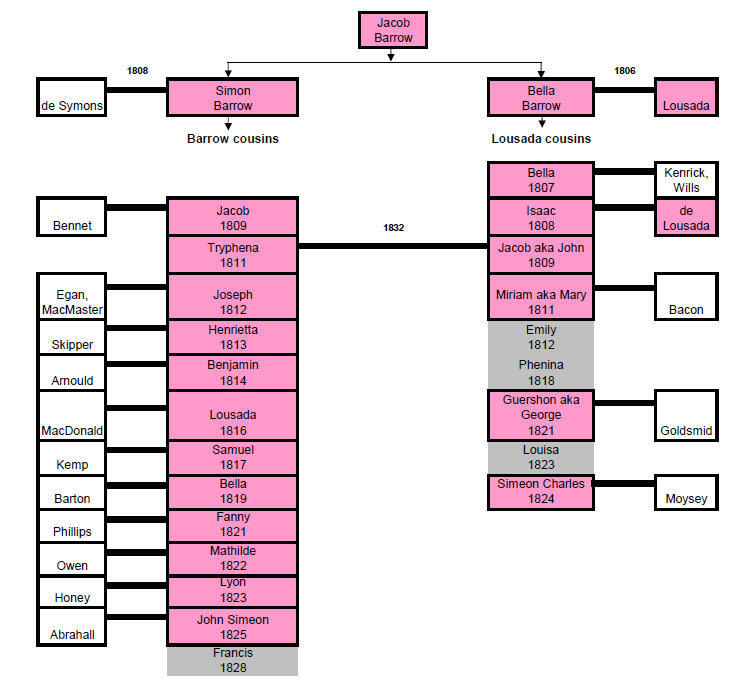 The absence of any further marriages of Lousada/Barrow cousins perhaps suggests the Lousada children remained separate! Perhaps Bella Baruh Lousada provided a cautionary example. And reviewing the 2 sets of cousins (see chart above) we see some differences. The Lousada upbringing seems to have concentrated on the old family strategy - marry well and if not marry a cousin! The Barrow upbringing seems to have been focussed on getting the boys into a profession - army (Joseph, Lousada, Lyon, Francis), medicine (Benjamin), law (Samuel) and the Anglican church (John Simeon).